This story talks about the adoption of digital paper in department store signage. Beyond cost savings of printing and placement/change out labor the battery powered signs can be changed automatically by a central server thus appealing to different buyers throughout the day. Appealing to stay at home mothers in the morning and teenagers in the afternoon. I wrote about an application like this back in May. I was marveling at the broad array of stuff available in a local Walgreens store this past weekend. Walgreens is trying to be the corner Wal-Mart. Offering a little bit of everything and a lot of some things I have to wonder who would ever buy. What Walgreens is really about is convenience and availability. While Walgreens is busy building stores every mile or so, in suburban areas, more and more of them are open 24 hours. So whether you need a prescription filled, an emergency pack of diapers or even Liquid Plumber Walgreens will be there. For a price. Nobody said Walgreens is a discounter. Walgreens is positioned to take the greatest advantage of RFID tags and digital store shelves. The prospect of real-time sales and inventory data combined with the ability to change prices in real time will be a huge benefit to retailers like Walgreens. On many products retail prices have long disappeared in favor of shelf pricing tags and UPC bar codes. Imagine when the humble shelf price tag gets wired. 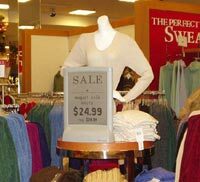 What if price tags on store shelves were display screens wirelessly linked to the same computers that handle inventory, pricing and cash registers? Then store managers have the ability to do some innovative pricing. Killer App Alert for the makers of digital paper. 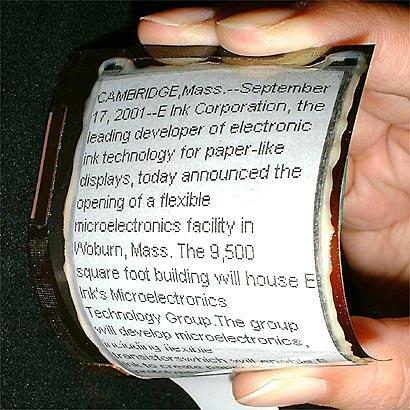 Companies like E-ink that make paper-thin flexible display material are looking to commercialize their technology ASAP. Simple black and white four or five line text displays are all that's needed. Smart display tags would click into power supply tracks running along the front edge of store shelves. These same tracks could contain sensors that could detect the quantities and type of RFID tagged products on the shelves. During the day Walgreens is certainly not the only place to buy diapers, cough medicine, or Liquid Plumber. So competitive pricing is critical. However, at 3am the story is different. Sure demand is lower but so too is supply. Walgreens may, in fact, be the only place to buy these and other emergency needs. Costs are also different. Overhead costs are greater at night as stores pay expenses with far fewer shoppers to support those costs. What if the computers could adjust the price of products in the store during different times? Prices could be higher at night and lower during the day. With digital shelf tags combined with RFID tags on products and sensors on shelves companion products could be marketed in new ways. A shopper selects a particular brand of shaving cream and instantly the price of that brand, or a competing brand, of disposable razors changes. Too much candy is on the shelves as Halloween approaches. No problem the computer can adjust prices on the fly. The value of a Mother's day card changes as the day comes and goes. The highest value and, consequently price, is between 6am and 10 am on Mother's day itself. Same value proposition for batteries on Christmas day. Price fluctuation based on market demand is classic capitalism. However, as the technology that facilitates this kind of control and adjustment becomes available, PR becomes critical. Remember the PR flack that killed the Coke machines that could raise the price when the ambient temperature went up? People found that to be opportunistic and unsavory. If only the headline read: Coke Machine Can Lower Prices When Temps are Cool. Fluctuating prices have to be perceived as an opportunity for people to save money by shopping when market forces dictate competitive prices rather than spending more when market forces dictate higher prices. Even our local Jiffy Lube stores are offering a discount if you bring your car in for an oil change before 10am on weekdays. Notice they're not saying we're going to charge more during peak hours. The bottom line is that in this world of increasing competition and mind blowing technology retailers need every tool they can get to stay competitive. Fluctuating prices facilitated by technology seems a natural progression. I received my first mortgage loans when I was very young and it helped my business very much. Nevertheless, I require the sba loan as well. I need a good compliment for each person but I also need a list of one word complements and the teacher is going to check them (sadly enough) examples: nice, smart, funny, brave, outgoing, etc.